The Alexandra Theatre was built in 1901 by William Coutts at a cost of £10,000 and was originally called the Lyceum. Its opening production was a play entitled The Workman, which ran from 27th May 1901, with tickets ranging in price from two shillings to four (old) pence. 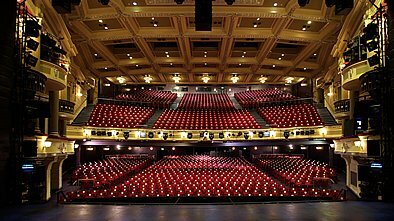 Perhaps most closely aligned with theatre, pantomime and musicals, the Alex as it’s commonly known as has an amazing history of hosting popular music. Help us build a gigography! I saw 10,000 Maniacs play a very memorable gig at the Alex T on Thursday 1 June 89 which I am pretty sure was the first headlining gig by that great band in B’ham (not aware they supported any other band on an earlier tour either and had been a fan since 1982). The gig was of course all seated and the cost was £6.50 . I kept most of my tickets from gigs from 1980 onwards and have around 350 now . Interestingly I was a member of JB’s Dudley from 1976 until it closed and do not have one ticket from the many hundreds of gigs I saw at that venue. it was all pay on the night and included The Police, U2 , Blur, Dire Straits, The Stone Roses , to name just a few of the names who played for literally pennies in the 1970’s and early 1980’s (eg U2 were 80p on a Friday evening !